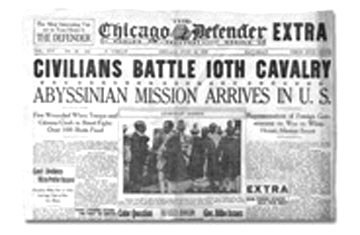 The Chicago Defender newspaper covered the first Ethiopian delegation's visit to the U.S. in 1919. New York (TADIAS) – The arrival of the first Ethiopian diplomatic delegation to the United States on July 11, 1919 made headlines in Chicago, where journalists eagerly awaited their opportunity to meet and interview the delegation. At the time Woodrow Wilson was serving as the 28th President of the United States. In Ethiopia, Empress Zawditu, the eldest daughter of Emperor Menelik, was the reigning monarch. Dejasmatch Nadew, Empress Zawdituís nephew and Commander of the Imperial Army, along with Ato Belaten-ghetta Hiruy Wolde Sellassie, Mayor of Addis Ababa, Kentiba Gebru, Mayor of Gonder, and Ato Sinkas, Dejamatch Nadew’s secretary, comprised the first official Ethiopian delegation to the United States in the summer of 1919. The main purpose of their trip was to renew the 1904 Treaty of Amity (Friendship) between the United States and Ethiopia (brokered when President Theodore Roosevelt authorized US Ambassador Robert P. Skinner to negotiate a commercial treaty with Emperor Menelik). The treaty had expired in 1917. This four-man delegation to the United States became known as the Abyssinian mission. The delegation headed to the White House in Washington D.C. after their brief stay in Chicago. 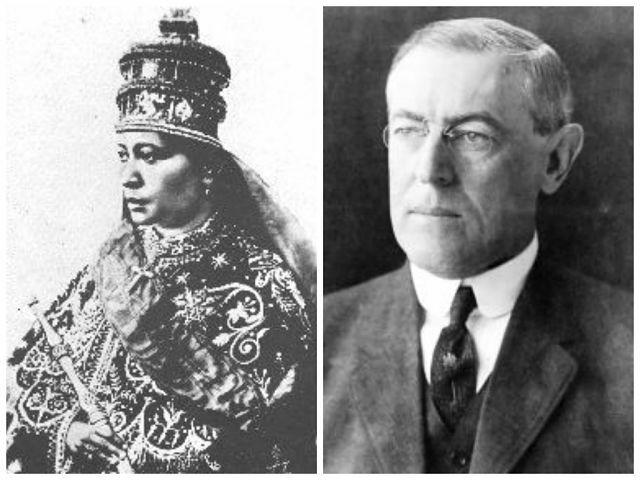 Empress Zawditu of Ethiopia (In office: 1916 to 1930) and US President Woodrow Wilson (In office: March 4, 1913 – March 4, 1921). Photos: Public Domain. The Ethiopian presence at the Waldorf Astoria in New York City, dressed in their traditional white robe and pant attire attracted large attention. Upon arriving in Washington D.C. they took up residence at the former Lafayette Hotel and awaited their formal presentation at the White House. The Ethiopian Mission enjoyed an overall warm welcome and before returning to Ethiopia they toured the cities of New York and San Francisco. They also visited an Irish Catholic cathedral, a Jewish synagogue, the Metropolitan Baptist Church in Harlem, and Yellowstone National Park. Liben Eabisa is Co-Founder & Publisher of Tadias Magazine. Good work Liben. Thanks for bringing this to the attention of the present generations. Very nice article, Ato Liben. My only wish is that we would know the names of all the delegation (always searching for my relatives). It is great for all of us, young and old to know the history of relations between the nations — some of which are difficult to uncover. Thanks for bringing this back into the light! What a nice article! Good job Liben! Thanks! it is empowering information. Fantastic most proffessional work . Liben Eabisa the original respected Abyssinian man. Thankyou. Wow! I never knew, what a story. good job sir! Great job. what else can I say? it is truly great. Bitam yemtiwoded Ato Liben, the article presented here “First Ethiopian Delegation to the United States 1919″ was vary edifying. As a descendant of Ethiopian origin born in the West, these noble artifacts are vary important for us, to those of us who have the vivid desire to one day return home to our beloved Country ETHIOPIA. I’m not a monthly reader of Tadias Magazine, however, I do try to find the time and occasion to read and at time issue a comment such as this. What I would like to know more is, if you so have the time to obtain some more artifacts on His Excellency Dr. Malaku Emmanuel Bayen, Ethiopian Emissary to Black America 1936.The Historic facts on the Shashamanne Land Grant in Ethiopia and the genesis of its Administrators in collaboration with the Ethiopian World Federation, Incorporated. Again I was pleased to have the opportunity to read about this noble historical artifact and is humbly looking forward to view some more. All the best to you, your staffs and all viewers of Tadais Magazine. Tanx for this info, i was happy to read this article. its educative and moral booster info. Great job! I just discovered this site and im sure im going to chek it out often from now on. Thank you. Great find, Good job! Ethiopians have always been respected around the world its sad to see us in the state that we are in at this current time. We must help our people to stand together and fight poverty. Great job. The trip of this distinguished delegation was great. I wish you could also report more on the racist behavior they encountered and how they dealt with it. On their trip back to Ethiopia the US goverment had to send them a letter of apology before they reached Ethipopia. Overall great aricle. Thank you for your historical look at the first Ethiopian delegation to visit the US. I found it interesting as an Ethiopian American. Keep up the good work. We are thankful to Tadias Magazine for publishing such important documentation about the relations of the US and Ethiopia. The history of Ethiopia’s diplomatic endeavors dates from ancient times, we were not always isolated from the rest of the world. Tadias, please keep the good work, with very best wishes and for prosperous new year. Thank you Ato Liben. What a moral story. That is the Ethiopia I know and admire. I hope you keep on digging for more uplifting history. Thanks again. Wonderful piece of history. Thank you for sharing. What an excellent recollection of history that most of us were oblivious of.